Our fully loaded breakfast bagel. 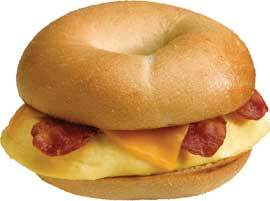 Take a bagel, add Egg, Cheese, and your choice of meat to start, then if you dare customize with The Garden or our seasonal extras! Or go for a traditional Egg, Meat and Cheese on an English Muffin!